The KP26M1XPM KitchenAid stand mixer from the Professional 600 series is finished in a premium Pearl Metallic color that will add style and sophistication to any kitchen. This model also includes a practical bowl-lift design and 6-quart stainless steel bowl that can yield 13 dozen cookies or 8¼ loaves of bread. Like all KitchenAid stand mixers, it is equipped with 10 mixing speeds that can meet all of your mixing needs, from stirring to whipping and everything in between. Professional 600 series with pouring shield, 6 qt. polished stainless steel bowl with comfortable handle, burnished flat beater, burnished PowerKnead spiral dough hook and wire whip, pouring shield, stain nickel hinged hug cover, commercial auto reset, comfort bowl lift handle, 120v/60/1ph, Pearl Metallic. Warranty not valid when used in commercial environment such as a bar or restaurant. 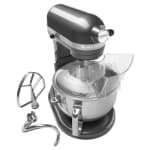 "I own this exact mixer and LOVE how easy it makes preparing food, and I am all about easy. It's powerful. I've put 5 pounds of soft and hard, roo..."
"I own this exact mixer and LOVE how easy it makes preparing food, and I am all about easy. It's powerful. I've put 5 pounds of soft and hard, room temperature cheeses into the bowl with herbs and chopped nuts to effortlessly create the best cheese balls you can imagine. Home made pimiento cheese is always in my fridge and friends love to receive a tub as a gift. The dough hook handles the heavy work and the flat beater will make it creamy. I couldn't get these results with a food processor because cheesy foods are just too sticky. The "lifter" feature lets the bowl down so you can scrape the bowl and add ingredients easily. Best gift I ever received for my kitchen."